Having been the main family home for decades, Grace is a very spacious apartment offering over 2,000 square feet to stretch out in. It has its own private courtyard and is situated on the ground floor, centrally within the building, but accessed from the back of the main house. 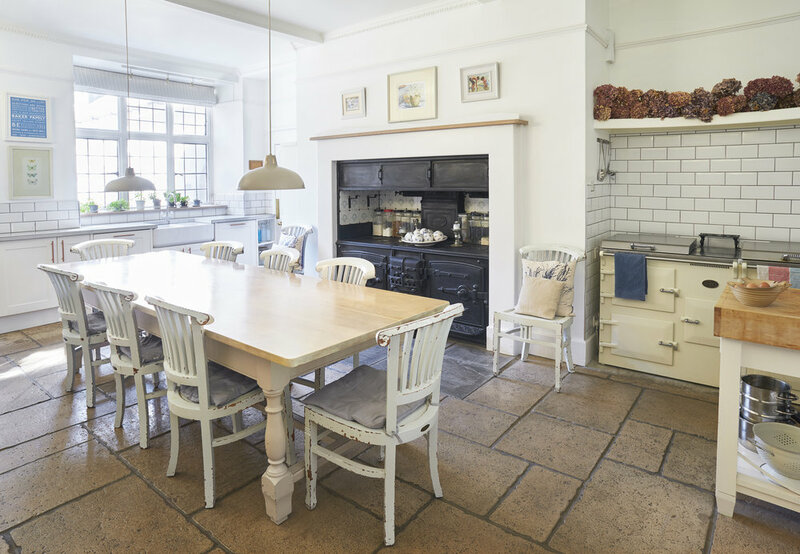 Grace was once the main hub of the house, featuring the grand kitchen and lounge, with high ceilings, a working fireplace, original decorative kitchen range and plenty of historic character. The master bedroom boasts a stunning free-standing bath and modern en-suite shower room. The apartment has access to its own private wet room and laundry room, perfect for the return from a day in the sea. Sleeps 9 across 4 bedrooms (‘Z beds’ for younger children can be made available for a small charge). Bedroom 1: Super king bed, with in room bath and ensuite shower room. Bedroom 3:Double bed, and single day bed. There is a shared family bathroom with large bath, walk in shower and toilet. A private laundry room and wet room complete with shower and toilet is situated just inside the front door. DVD player, flat screen TV (bedroom 1 also has a TV). Dining and lounge seating for twelve. A large double electric AGA style oven with hobs, fridge, freezer, microwave, toaster, two dishwashers. Access to shared tumble dryer and washing lines.